For your most nurtured, radiant, and touchable skin 365 days a year, follow your skincare for the bath 3 easy step routine: CLEANSE, EXFOLIATE and MOISTURIZE that we shared just a few blog posts earlier in January. Now, let’s focus on EXFOLIATION and FRAGRANCE, because it’s the month of romance after all. Yes, we decided one day simply couldn’t wrap itself around something as exquisite and powerful as romance, so we’re going with a month of romance, and hope that’s okay with you! 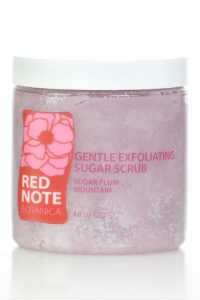 give your skin an overall radiant healthy glow after rinsing off your scrub. One of the many lovely things about sugar is that it easily rinses clean! After your gentle exfoliating massage, take time to treat your skin to the vitamin and nutrient rich creamy butters and oils in our Gentle Exfoliating Sugar Scrub that melt on contact with your skin (shea, illipe, and cocoa butters, and sunflower, apricot, grape seed, and rice bran oils), and naturally penetrate the top layer of your skin as you soak. You have nothing to do to reap these benefits – just lay like a manatee (or water animal of your choice, but I happen to adore kind peaceful manatees) and let the oils and butters caress your skin. Feel the difference immediately. The softness that you feel is a combination of the gentle sugar exfoliation which smooths your skin texture and the natural oils and butters that penetrate your skin’s surface while you soak in the tub to make it feel velvety soft. For more info about the nutrient and vitamin-rich oils we use in our Gentle Exfoliating Sugar Scrub, visit the Ingredients Page on our website. How can life get any better? 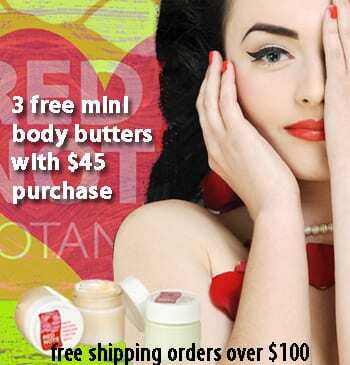 This month, with your on-line order of $45, you’ll receive 3 FREE body butter minis (.5 oz ea), a $15.00 value. Perfect size to pop into your purse, and apply throughout your day after you wash your hands. You know how dry and irritated your hands can get when you wait until you get home to apply your lotion or body butter? Why wait, simply apply with these super fab travel minis! They’ll arrive with your order, no need for a special promo code. During dry cold winter months, even when you moisturize in and out of the bath, your skin can still tend to be dryer than at other times of the year. Fragrance will evaporate more rapidly from dry skin because it’s the moisture on our skin that holds our fragrance and extends its longevity on our skin. 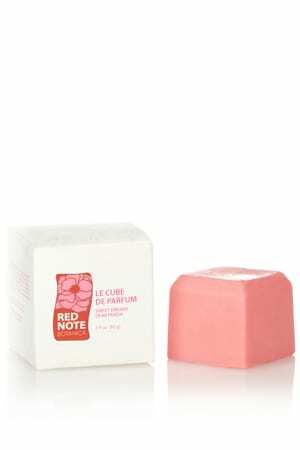 Rejuvenate your skin and celebrate your spirit with LE CUBE DE PARFUM. Our solid perfume cube to the rescue of dry winter skin! Your new BFF, perfect perfume cube on-the-go. Pop one or more in your purse (available in 20 fragrances to match our soaps, sugar scrubs, lotions, cremes and body butter fragrances) to take wherever you go – perfect for gym, office, around town, on a date, on a plane (it’s 3 oz, and it’s solid so no airline can refuse it). Natural shea butter and apricot and avocado oils “formulated-in” to leave your skin butter soft and help your fragrance to intensify and last longer! It’s a perfect all-in-one product! After your workout, shower (and a healthy detox steam and/or sauna, the frosting on the cake in my book), apply moisturizer (lotion, creme or body butter), followed by several sensual sweeps (5 or 6, and don’t be afraid to press down gently but firmly, with a massaging action) of your favorite LE CUBE DE PARFUM on pulse points, neck, inside elbows, decollete, arms, legs, and wherever you’d like your fragrance to linger and drench your skin with moisture. You’re good to go, wherever that might be! One more thing about LE CUBE DE PARFUM – it seems to last FOREVER! Sometimes we wish it wouldn’t last quite so long, jk (just kidding) but for you, that’s a definite plus! Hey, the winters are long here in Minnesota, so we all deserve the delightful pick-me-ups we get from fragrance throughout our busy days! 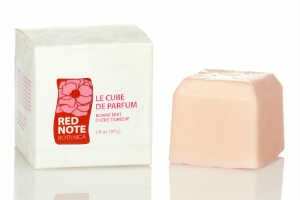 Our friends who love LE CUBE DE PARFUM love these too, and they’ve quickly become bestsellers, especially for those of you who head out of the gym to the office, run errands, etc.! We love that you pack your Solid Perfume Twist Tube in your exercise tote! Enjoy a beautiful soft, silky, and fragrant month of love! Rejuvenate your skin with gentle exfoliation and celebrate your spirit with lusciously fresh fragrances all day and night. Your loved ones will cherish the beauty of your skin and fragrance, and you’ll feel fab in your skin – can you think of a more joyful way to not just get through, but celebrate this winter?